Solar air conditioner: how do they work? • The Air Geeks, reviews of air conditioners, dehumidifiers and air purifiers. Blog, Portable Air Conditioners » Solar air conditioner: how do they work? A solar air conditioner is an environment-friendly air cooling solution that uses energy from the sun. It is not only a suitable solution for transforming the environment of your room but also a solution to greenhouse gas emissions. Ordinary air conditioners are electricity powered and the growing use of these appliances means more use of electricity. A good fraction of electricity is generated by engines that run on petroleum products. Fuel combustion process is a big contributor of carbon dioxide emissions. Solar air conditioners use green energy from the sun and their use means a decrease in the amount of carbon dioxide released to the air. This hybrid solar-powered system uses energy from the sun to power the air conditioning system of your home. Solar panels are used to capture energy from the sun. This system also allows users to use electricity as a back-up source of energy. If you are looking for a system that will help you to cut your electricity bill, then you should consider this hybrid solar-powered air conditioner. This cooling system uses energy from the sun and water to transform your home into a comfortable place with cool air. The system employs an absorption process, hence the name absorption chiller, to cool your room and maintain the desired temperature. It uses water as a medium of transferring heat away from the space it is supposed to cool. 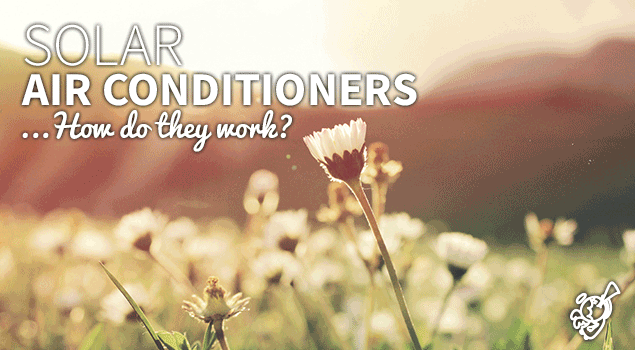 Unlike portable air conditioners or central air conditioners, absorption chillers don’t use a refrigerant. In addition, this system is highly effective and energy efficient. If you are looking for an environment-friendly cooling system that is energy efficient, then you should invest in a solar air conditioner. Apart from helping to cut your electricity bills, a solar-powered system indirectly helps to protect our environment from the harmful effects of using petroleum products to produce electricity. Now you already know the available solar-powered air conditioners and it is up to you to select the system that is best suited for your cooling needs.